The Portland Trailblazers will host the Oklahoma City Thunder on Tuesday night in Game 2 of this Western Conference first round meeting. The Blazers (53-29, 32-9 home) finished as the 3rd seed for the second year in a row in the West, but they were riding a 10 match losing streak in the playoffs. Portland has regularly underperformed in the postseason lately, and Game 1 was a very important one for them. They managed to keep focus in the clutch and claimed a crucial 5 point win to start the series. The Thunder (49-33, 22-19 away) entered the playoffs in solid form on the back of 5 consecutive wins and the expectation was (still is) for them to knock out the Blazers, despite being the lower seed. With Paul George, Russell Wesbtrook and a solid supporting cast, the Thunder look dangerous in these playoffs. However, a horrific shooting night kept them from winning Game 1. Bet on Blazers v Thunder and claim your 100% (120 Eur) welcome bonus at LSbet! Team news: The Blazers will miss Nurkic, their third best player, who got injured at the end of the regular season. The Thunder have no relevant absentees. OKC’s loss in Game 1 actually almost strengthens their case for winning this series, and also Game 2 (since they can not afford to lose this as well). OKC had a horrid night from the field, shooting just 40% overall and only 15% (!!) from three point range. That won`t happen again. Portland on the other hand played well and shot the ball well (42% and 44% from three). Despite the huge discrepancy in the three point percentage, it was still only a 5 point game. 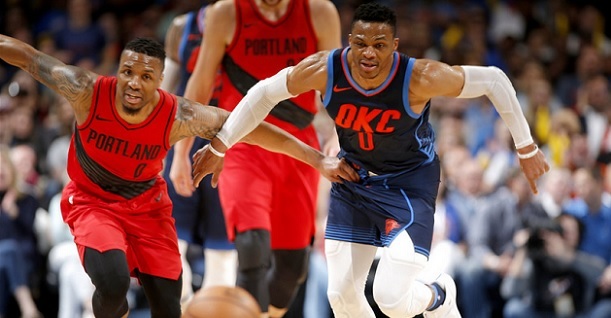 This Portland side is just not built from the playoffs, and it`s no surprise they lost 10 straight in the postseason until edging OKC over the weekend. The Blazers rely too much on two small guards in Lillard and McCollum, who are not as effective in the playoffs due to the game getting more physical. Now they don`t even have their “B plan” (going to Nurkic), so it`s really just Lillard and McCollum carrying the load. The Thunder are a good defensive team, they should ramp up the pressure on those two guys tonight, keep pounding the glass, and if they don`t have another catastrophic shooting night, they will feel good about their chances. The Blazers won`t play much better than in Game 1, while the Thunder can`t possibly shoot that bad again from deep. Look for OKC to tie the series here and steal home court advantage from the Blazers. My tip will be OKC to win. Prediction: Portland Trailblazers – OKC Thunder 105 – 111. Like us? Enter your e-mail and get Betdistrict's editor picks every morning. One e-mail per day containing all tips.